Annan Athletic bounced back from their Irn Bru cup defeat at Peterhead with an excellent victory over fancied title contenders Elgin City at Borough Briggs. The points were no doubt secured in a first half where Annan controlled the flow of the game with the winning goal coming via the penalty spot mid way through the half. Aidan Smith netted the decisive goal from the spot. Annan boss Peter Murphy made changes to the side defeated at Peterhead with Jack Brannan and Owen Moxon being given starting positions and Murphy relegating himself to the bench. Annan started the match on the front foot and in the opening minute the sparse Annan fans gasped as Rabin Omar’s effort struck the top of the cross bar. Annan’s dominant start continued as Elgin were forced to defend a couple of quick corners, this was followed by a Brandon Luke effort in the 15th minute which saw his low shot slip past the upright. Elgin’s first real opportunity arrived in the 17th minute after Chris Dodd broke from the half way line but his direct run ended with a dissapointing shot past the post. Annan were then presented with a free kick 30 yards out but Sinnamon’s effort failed to hit the target. Annan took the lead via the penalty spot in the 22nd minute, the goal was created by the first touch of Rabin Omar which enticed keeper Marc Waterson to challenge, resulting in the keeper fouling Omar. The referee immediately pointed to the spot and Aidan Smith dispatched the spot kick into the net to give Annan a deserved early advantage. It was just reward for Annan at this stage of the match. Annan continued to take the game to Elgin but in a rare foray forward for the home team in the 28th minute handed out a warning when Thomas Reilly finished a penetrating run with a disappointing shot straight into the arms of keeper Jim Atkinson. Annan continued on the front foot, Jack Brannan tested keeper Marc Watters and minutes later the keeper was beaten by a Swinglehurst header from a Ryan Sinnamon free kick in the 33rd minute. Annan then missed what could turn out to be the miss of the season in the 36th minute. Annan defended a corner and broke swiftly leaving Elgin exposed with Aidan Smith’s pace taking the ball from his half of the field into the opposing half and with Annan three on one Smith laid the ball off perfectly to Brandon Luke who with the goal at his mercy and Rabin Omar also free Luke’s shot failed to hit the target. It was a real let off for the home team and an opportunity which the on loan Dunfermline man will no doubt look back on and know he would do it differently if presented with a similar opportunity again. After a mediocre first half by the home team which saw keeper Atkinson rarely troubled Elgin started the second half with more determination and for the first time in the game Annan were being asked to defend. Chris Dodd forced a corner in the 49th minute and the ensuing play saw the ball fall kindly for Jamie Reid who blasted over the bar from 15 yards. Elgin continued to take the game to Annan but their opportunities were fairly limited with Annan looking composed and solid at the back. The Annan goalkeeper Jim Atkinson pulled off an important save to deny Daryl Mchardy in the 60th minute after the Annan keeper pulled of a superb save low down at the post to deny the Elgin Defender. At the other end Elgin breathed a sigh of relief when Swinglehurst’s over head kick struck the cross bar with the keeper beaten. It was a let off for the home team. Swinglehurst was replaced in the 73rd minute with cramp with Murphy replacing the central defender and almost immediately Murphy set up Dan Orsi who headed narrowly past the post. Annan were fortunate in the 80th minute after Orsi slipped at the edge of the box presenting Thomas Reilley in with an opportunity but fortunately for Annan his effort went wide of the target. Annan brought on Blair Henderson at the expense of Dan Orsi for the final 10 minutes which saw Elgin taking the game to Annan but without penetrating the Annan rear guard. It was an important victory for Annan as they lifted 3 precious league points as they strive to move up league. Clyde had the result of the day defeating the unbeaten Stirling Albion 3-2 with ex Annan player Barry Cuddihy scoring the winner. Montrose continued their excellent start with a last minute goal which earned them a point at title favourites Peterhead. Stenhousemuir lifted the points with a single goal victory over Cowdenbeath and Edinburgh City secured their first league victory with a 1-0 victory over Berwick Rangers. Elgin City : Marc Walters, Cameron Eadie, Lewis Strapp, Darryl Mchardy, Stephen Bronsky, Jon Paul Mcgovern, Jamie Reid (calum ferguson), Brian Ferguson, Chris Mcleish( Jordan Allan 66 min), Thomas Reilley , Chris Dodd ( Bruce Anderson 66 min) Substitutes not used: Mathew Cooper, Scott Smith, Ali Sutherland, Trevor Dear GK. 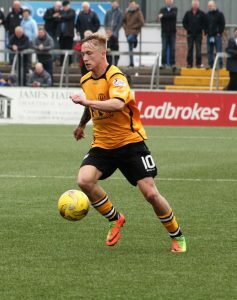 Annan Athletic – Jim Atkinson, Scott Hooper, Jack Brannan, Owen Moxon, Peter Watson, Steven Swinglehurst (Peter Murphy 73 min) , Dan Orsi ( Blair Henderson 84 min) , Ryan Sinnamon, Aidan Smith , Rabin Omar, Brandon Luke (trialist 58 min). subs not used Alex Mitchell (gk), Ellis Pearson, John Cunningham, Kevin Rutkiewicz. Referee – Grant Irvine Assistants Marc Mclean, Scott Robert Anderson.